The sun constantly emits a flux of electrically charged particles into space, mostly protons and electrons, known as solar wind. This plasma affects the entire solar system, including Earth’s magnetic field and is therefore crucial to our understanding of space weather. Now, a University of Alabama in Huntsville (UAH) student is conducting a research into the transport of electrons and electron heat flux in the solar wind, which could provide new insights about this stream of energized particles emitted by the sun. Bofeng Tang is a Ph.D. candidate in the Department of Space Science at UAH. He holds a master’s degree in physics and works under the supervision of National Academy of Sciences member Dr. Gary Zank, who serves as both chair of the department and director of UAH’s Center for Space Plasma and Aeronomic Research (CSPAR). 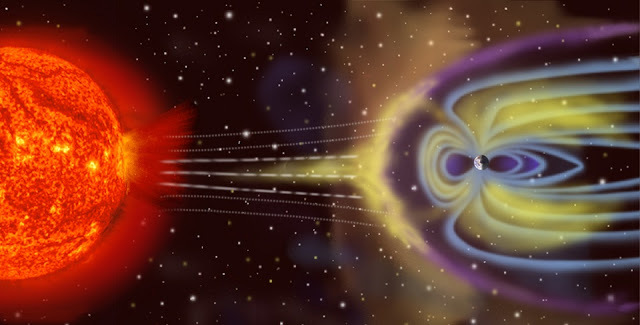 “I am hoping that Bofeng's research will clarify some aspects of the collisionless heat flux associated with the various solar wind electron populations, which will guide us then towards a better description of electron transport throughout the solar wind,” Zank told Astrowatch.net. Tang has recently received a 2017/2018 NASA Earth and Space Science Fellowship (NESSF). The fellowship includes a $30,000 award and can be renewed for a total of three years. NASA’s Heliophysics Division, which helps further the space agency’s research objective of investigating the sun and its interactions with the solar system, chose Tang’s study as one of only nine NESSF applications. The fellowship secures funding for Tang’s research and lets him concentrate on in-depth study of the transport of electrons in solar wind. “The NASA NESSF is important to students, both in terms of the prestige that it typically carries (there are few awarded annually so it is a reflection on the student's potential and also the proposed problem), and in terms of guaranteed support for up to three years. This guarantee of support allows a student to attack a good problem in some depth,” Zank noted. Backed by NESSF, Tang will focus on solving the problem of how solar wind electrons are transported in the solar wind. This question perplexes researchers and it is still far from being solved, in part because the electrons are quite collisional in the solar corona and below but tend to be collisionless further out from the sun, experiencing scattering primarily due to waves and turbulence. “Understanding what waves and turbulence is responsible for the scattering of the various electron components (core, strahl, halo, energetic electrons) is still rather unclear. At this point, we cannot even accurately write down the correct set of equations that adequately describes how electrons are transported from one part of the solar wind to another,” Zank said. Currently, the scientists do not have a fundamentally sound description of electrons in the solar wind. Tang’s research is expected to establish a better framework for understanding the solar wind dynamics implicitly advancing our understanding of space weather. According to Zank, Tang’s study could also help improve the reputation of CSPAR when it comes to research in the field of physics. “My Department of Space Science and the Center for Space Plasma and Aeronomic Research at UAH regard our students research as vitally important to making progress in the physics of the space environment and in space weather. This research helps build our growing reputation and the value and importance of it relates both to the fundamental science we explore and also the increased reputation of our students,” Zank concluded. Don't hesitate taking a look at this blog for even more articles on the thematic like this article. After the confirmation you will obtain registered account to login discovercardlogin.org/ This was implemented as an outcome of earlier purchase. There are many resource guides and pricing books available that can provide value guidelines based upon the overall condition of the vehicle. BMW Export UK reaches new altitudes in technology. The Carnelian Siver Earrings has got a hint of subtlety and charm which will always grab everyone's attention. I play my enemies like a game of chess where I rest no stress, if you don’t smoke sess lest I confess, my destiny’s manifest read this. The farmkey gives you an amazing shopping experience even in low bandwidth areas. Get the detailed product description and best agriculture practices by the Agricultural specialists. You have got the powers to share the information on WhatsApp, Facebook, Twitter, and through other media to your friends and family. Click here heem sohna. I think the topic of space is very interesting. And to go to university in the direction of astronomy, you must have very high marks. You will help tips on writing essays from professionals customessaymeister .